Excitement continues to build around UFCW Canada's groundbreaking webCampus program. Since it was launched in January 2009, more than 5,000 UFCW Canada members and their families, as well as social partners from across Canada, have enjoyed the benefits of close to 100 English and French free online courses. 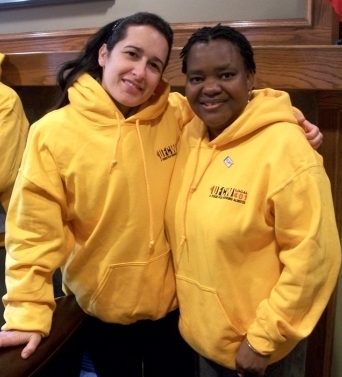 webCampus is proving to be an excellent resource for members and partners who have varied interests or specific training and education goals, like UFCW Canada Local 401 member Annatolia Chinoputsa, pictured with national representative and webCampus instructor Debora De Angelis. "My webCampus goal is to earn the Occupational Health and Safety Certificate through Mohawk College," says Sister Chinoputsa who works at XL Lakeside in Brooks, Alberta, and who is well on her way to achieving her training goal with 27 completed courses. "I find webCampus very interesting and informative, and the Tec Room is great because you meet participants from other courses. You also get different opinions from different people from different places in Canada. I like sharing experiences with fellow-members and hearing about their different workplaces." The Tec Room is a popular new webCampus feature that allows participants to have real-time video conversations with instructors and other participants. This year's webCampus June courses will run from Wednesday, June 2, to Monday, June 28. All interested members are welcome to sign up by going to http://www.webcampus.ufcw.ca/. All courses are free to members and their families. For more information on webCampus, email webCampusadmin@ufcw.ca or call an instructor toll free at 1-866-865-0202.